Get a £75 amazon / M&S / B&Q giftcard when you take out a direct line life insurance policy (£6 per month / 3months premiums required so £18 cost if you cancel ) max 2 per household. looks like a good deal. what are they like when you want to cancel, do they moan at youlooks like …what are they like when you want to cancel, do they moan at youlooks like a good deal. Just cancel the direct debit. The policy would just lapse. How long does it take to get the vouchers though? More than 3 months?! Got turned down for being epileptic anyone know of any insurers who insure people with epilepsy? Would rather have TCB to match that. Hear so many issues with QC lately with BF/CM cashbacks. I took this deal out early in the year. Still waiting for my vouchers and/or cashback from quidco. I got declined , apparently my lifestyle isn’t up to standard !! Thanks, got £6.00 per month, will give it 3 months and cancel if they being awkward. It mentions annual direct debit, so presumably monthly is ok? Otherwise how are people paying and cancelling? It mentions annual direct debit, so presumably monthly is ok? Otherwise …It mentions annual direct debit, so presumably monthly is ok? Otherwise how are people paying and cancelling? Sorry I meant is there a monthly direct debit option as opposed to an annual direct debit? Both TCB and Quidco mention annual direct debit as an exclusion. Would rather have TCB to match that. Hear so many issues with QC lately …Would rather have TCB to match that. Hear so many issues with QC lately with BF/CM cashbacks. It won't lapse, they'll cancel it. That would mean you have to declare to every insurance company that you've had a policy cancelled by an insurer for 5 years and may either get refused cover or increased premiums, or not be given the option to pay monthly. They may also chase you for the cancellation fee. It can also have a negative impact on your credit rating. It won't lapse, they'll cancel it. That would mean you have to declare to …It won't lapse, they'll cancel it. That would mean you have to declare to every insurance company that you've had a policy cancelled by an insurer for 5 years and may either get refused cover or increased premiums, or not be given the option to pay monthly. They may also chase you for the cancellation fee. It can also have a negative impact on your credit rating. Yes, if you cancel. Stopping your direct debit isn't cancelling, it's missing payments. I should know, I sell the insurance. I took this deal out early in the year.Still waiting for my vouchers …I took this deal out early in the year.Still waiting for my vouchers and/or cashback from quidco. How early in the year? What date did you take it out? yOU SHOULD ALSO mention who actually issues the insurance .. I suspect its with legal and general.. so if you have any other products , or have applied thru other orgs, they will have your details . Data Matching . Either way I got a big premium for £6 a month. really!!! Damn, I did one for each, me and my wife, we'll see what we end up with. Who issues the insurance please bcos i applied for the other two deals? really!!! Damn, I did one for each, me and my wife, we'll see what we end …really!!! Damn, I did one for each, me and my wife, we'll see what we end up with. I wonder which would be more likely to pay (and quicker too): The voucher or TCB? What do you think? Got turned down for being epileptic anyone know of any insurers who …Got turned down for being epileptic anyone know of any insurers who insure people with epilepsy? I wonder which other group will be turned down? its a long form that needs to be filled up. I don't that's correct. My understanding is you need to declare if you have been refused insurance. Once DD has been cancelled they will normally send you a few letters. If don't receive any letter last letter will just say your policy has lapsed has not value. That's end of it. They are not refusing the policy. We are not continuing with the policy by not paying the monthly premuim. Yes, if you cancel. Stopping your direct debit isn't cancelling, it's …Yes, if you cancel. Stopping your direct debit isn't cancelling, it's missing payments.I should know, I sell the insurance. I don't that's correct. My understanding is you need to declare if you …I don't that's correct. My understanding is you need to declare if you have been refused insurance. Once DD has been cancelled they will normally send you a few letters. If don't receive any letter last letter will just say your policy has lapsed has not value. That's end of it. They are not refusing the policy. We are not continuing with the policy by not paying the monthly premuim. It is correct, I literally sell this insurance as my day job. Some companies ask you to declare if you've been refused, others ask if you've ever had a policy cancelled by an insurer. 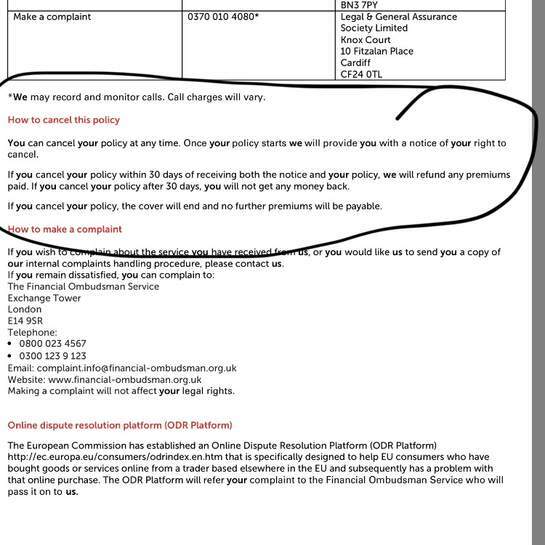 No longer paying and leaving it up to the insurer to cancel is, by definition, having a policy cancelled by an insurer. If you just stop the direct debit leading to a cancellation, you'll no longer be allowed installments on any Direct Line policy (or any sister companies such as Churchill or Privilege for example) for 5 years. Do it twice and you'll be blacklisted. Other companies may also refuse you if they ask the same question or may offer increased premiums instead. And missed payments also affect your credit rating. Why would anyone do this just to avoid having to phone up to cancel it properly? Still waiting on any communication from Direct Line in relation to the voucher offer.. Been nearly 2 months now! In contrast, L&G offered a choice 3 weeks after the policy went live ready to pay out in 3 months time.